Life Care Clinic, D-52, Greater Kailash, Enclave - II, New Delhi - 110048. EFT is clinically proven to lower stress, anxiety, tension, depression, physical tension, fears, limitations and blocks. The initial training is 3 days long and can be as a part of a personal development/self healing program or to become qualified as a Practitioner and earn a living by making a difference to other people’s lives. She has conducted training programs and workshops for various corporate groups like GMR, Bharat Petroleum and NGO’s like SOS Children’s Villages. Dr Gupta is the Associate Director of Centre for Child and Adolescent Wellbeing (CCAW), an multi speciality Institute for Child Mental Health, New Delhi and Delhi Area training Director for Love Humanity International. For full details of what will be covered during the 3 days and course curriculum. 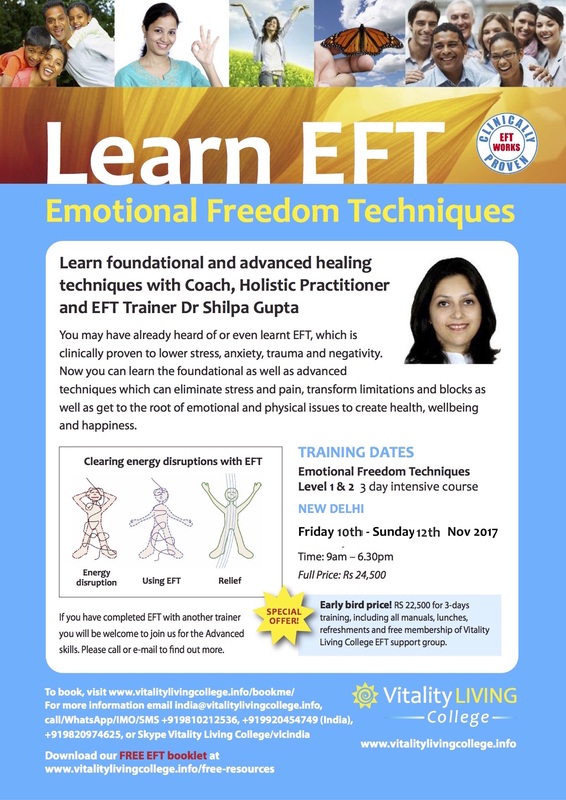 There are thousands of stories on how attending training with EFT has resulted in healing, personal transformation and change. In the case of Vitality Living College founder, Dr Rangana Rupavi Choudhuri (PhD), she overcame daily migraines and chronic pain in her body after having learnt EFT. Venue & Address: Life Care Clinic, D-52, Greater Kailash, Enclave - II, New Delhi - 110048.